Normally the helmet is used to keep telepaths out of your head. Would the helmet work in reverse: when a telepath wears it, their abilities can't affect anyone? I tried searching for the answer to this and the only relevant thing I found was an old thread on Reddit, but no actual answer. In New X-men #137 Kid Omega uses a copy of Magneto's helmet to suppress Professor X's abilities . 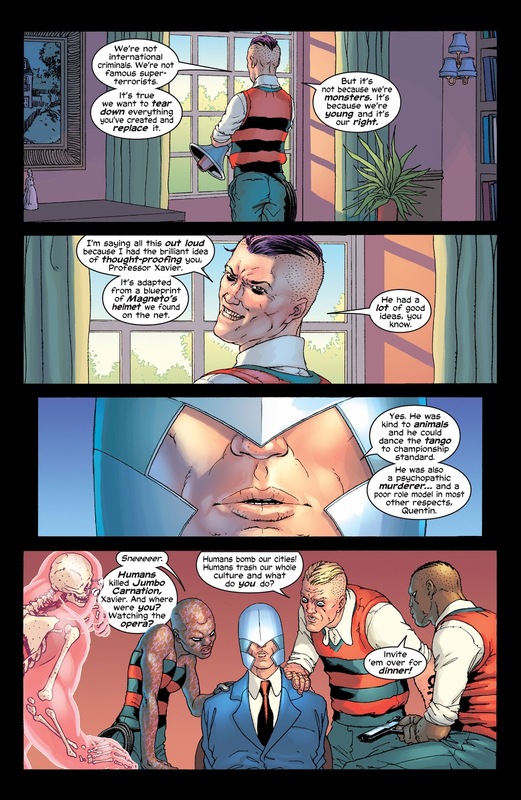 During Astonishing X-men Vol.3 #44-47, a weird NO-BALDER Prof.X from another dimension captured 616's Cyclops...He wanted him to run some creepy Engine so that they could get energy again and Cyclops would die too...Sounds terrible, huh~ So Cyclops started a violent revolution with other prisoners: a GAY-Wolverine, a TEEN-Nightcrawler, a Mrs.SUMMERS-Emma. Finally the TEEN-Nightcrawler send a Magneto's Helmet on EVIL-HAIRY-Xavier’s head... Well~That's how the evil Xavier failed... Absolutely it would works on 616/Prime Earth, I think. How can Hank shrink without his Ant-Man suit?